Hello to our 50 wonderful followers! It is so gratifying for Sheree and I to see such great interest in our humble endeavor. When we chatted a few months ago over email about starting a scene challenge blog we had no idea that it would be so well received. 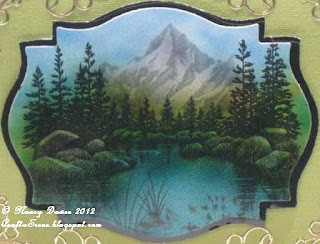 Thank you to all of you who are interested in working with your scenic stamps. We have had several comments from people who said that they wanted to work with these great images but didn't know what to do or how to do it, or that their stash had been sitting in a drawer unused for too long. Well, I hope that you will all help us make this challenge blog useful and fun! Today I am sharing a card I struggled over for several days. When I took a Copic coloring class last year I was introduced to air-brushing. 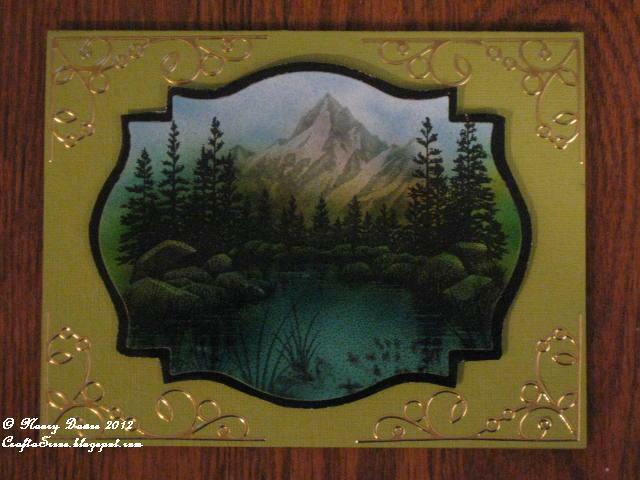 I thought it would be fun to try with Stampscapes images on glossy paper. I think the results are great, but I still have a lot to learn. First, I cut my glossy card stock into 4 sheets. I comes 8 1/2 x 11 so I cut at 5 1/2 long ways and then 4 1/4 to give me 4 pieces to work with. I find this is a good starting size for the size of cards I make. I stamped 049G Lakeside Cove Large with Momento Black ink. I only wanted the central portion of 188F Rocky Peaks so I placed small pieces of tissue over the trees on both sides of the cove. I stamped the mountain with Momento London Fog because I wanted it to be light and misty. Next I set up my air-brushing device from Copic. Previously, I had used the little can with adapter, but when I went to replace it, the scrapbook store only had the bigger can kit. It is probably for the best considering how many test samples I made. The instructions for setup were pretty simple. I found the toughest part to be getting the Copic nib in the right place for optimum spray. I started out with BG18 for the water area. I sprayed more coats near the boulders because I thought there would be shadows there and I left the middle section lighter. I tried other BG colors but found this one to have the most pleasing effect. Next I sprayed the grasses and a little of the trees with YG25. I chose that color for its brightness and mossy color. In the Northwest we have a lot of moss! Of course, that was too yellow for the full effect of the trees so I added a bit of G17. I sprayed the mountain with C5 and followed that up with a bit of E35 and E37 for the misty lower section. I think I added E37 to some of the boulders too. The sky was my favorite part colored with B24. By varying the spray - closer to the paper and farther away - I was able to get the slight effect of light clouds in the blue sky. Lastly, I stamped 071E Rocks and Reeds and 225D Flock in Water to the foreground with Momento Black. Our challenge this month is anything goes with a scene. There is still time to get your entry ready and posted. You may enter up to 3 times! Don't forget we have a DT Call going until January 10th. Just add your comment of interest with your blog address and we will take it from there. Thanks for stopping by. I hope you too with try creating a scene with the air-brushing technique. Amazing is what comes to mind, wow, love it!! Ultra fantastic Nancy! This is gorgeous! I looked at the Copic airbrush set at my local store but it was $300 so it was only a quick look! The deep colours are so rich looking.. well done! This is beautiful - I love the mountain in the distance and how you've framed the shore line with trees. Never seen one of those gadgets before! OH MY STARS!!!!! Girl this is jaw dropping gorgeous!!!!! Are you sure you are just beginning? Look slike you have been doing scene forever! This is fantastic!!! Beautiful Nancy!! Great step by step tutorial!!! AWESOME ! Very interesting post and a beautiful creation showcasing " craft a scene technique"
What an amazing talent you have for this is a stunningly clever card! Its more a piece of art! 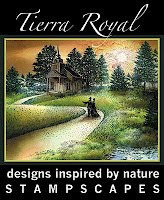 It resembles Bob Ross to me as hubby paints so Ive seen my fair share of Bob Ross! Just called on in via MIM! Gorgeous rich, depp color! Can't wait to see who makes the DT!! Wow! This is amazing! Love the rich, deep colors you achieved. Saw this on the iCopic challenge and had to comment. gorgeous card!! Love how you colored with air brushing!! You did a fantastic job!! Regarding prices for the air brush system. I bought an air brush air compressor from harbor freight for right at $40 USD and then bought the Copic converter kit which is just the handle and hose. If you do that, then you will need to also buy a hose from the compressor that hooks to the Copic tube... but it's super cheap, only a few bucks for that. Gorgeous!! Thanks so much for playing at iCopic.